The Adams Driveshaft 1310 Heavy Duty Front Driveshaft Yoke Style with Spicer Solid U-Joints is designed to withstand the toughest terrain in your Jeep Wrangler JK. 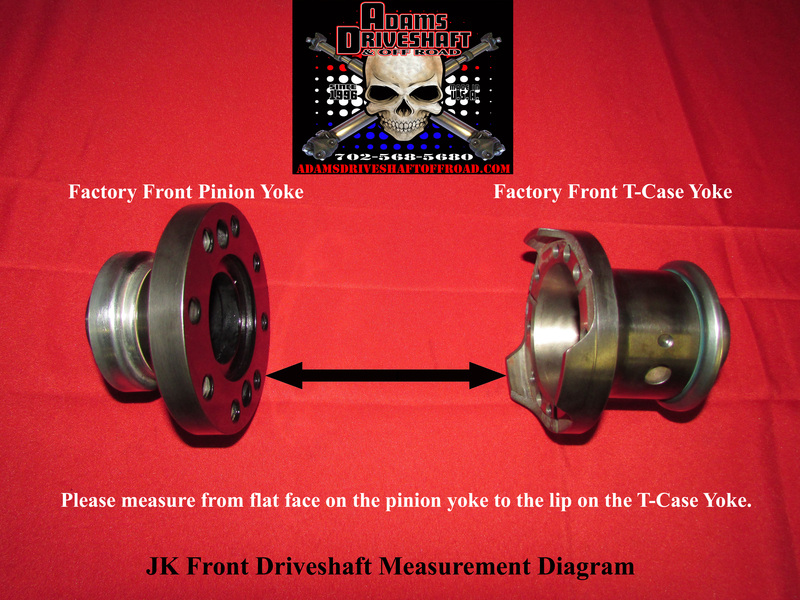 This driveshaft is made to order so if you have altered the differential or transfer case in any way, please let it be known upon ordering (EX axle swap, t-case upgrade). One (1) 1310 2 1/2" X .95 Wall Rock Crawler driveshaft with Spicer Solid U-joints, and a flange on it that fits your front end. Lifetime Warranty if you twist our Tube or Break our Welds due to Torque. One (1) 1310 Front Dana 44 Pinion Yoke. One (1) Set of 1310 U-bolts. Lifetime Warranty on the driveshaft welds and tubing if you break due to torque. No warranty if components break due to bad angles or not being maintained properly.